This page shows the latest Porter Novelli news and features for those working in and with pharma, biotech and healthcare. 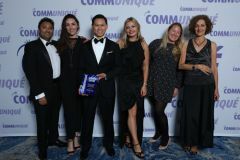 90TEN was in a strong category alongside other finalists from Aurora Healthcare, Porter Novelli, BioSector 2 and Havas Lynx. HealthShare sees the group'sand Porter Novelli agencies collaborate on supporting innovation and growth in the UK's healthcare PR specialism capability through a series of agency-focused training sessions. Other signatories active in the healthcare sector include Porter Novelli, Edelman and the Chandler Chicco Companies. Published: 01 Feb 2011. Client:Boehringer Ingelheim and Pfizer. Agency:Porter Novelli. Campaign:COPDexchange Medical Education Programme. She also brings experience as an associate director from Porter Novelli and Edelman, where she led a number of consumer health and beauty campaigns. Prior to this, she spent five years at Porter Novelli leading its UK Boehringer Ingelheim respiratory account. She has almost 15 years' experience in healthcare comms and joins the Richmond, UK-based agency from Porter Novelli' s sister agency Paradigm Communications.